If you had our blog about Netgear Aircard 790s, you may know the Aircard 790s was the world’s first 4G LTE mobile hotspots with a touchscreen, which makes it a very attractive mobile pocket router. Huawei also presented a new 4G Mobile Hotspot with the touchscreen, and the model is Huawei E5787, also named Huawei Mobile WiFi Touch. If you are looking for a 4G mobile router with a touchscreen, the Aircard 790 and Huawei E5787 could be considered. 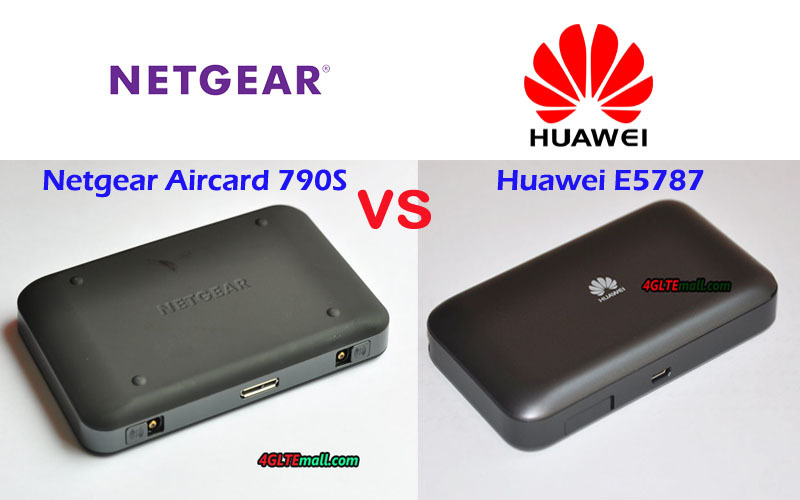 However, someone may ask: what’s the difference between Huawei E5787 and Netgear Aircard 790s? Which one is better to buy? 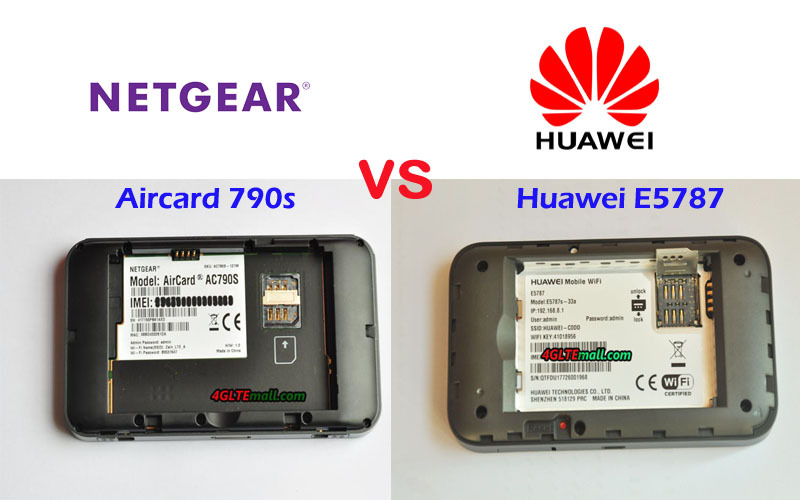 In this article, we will review the difference between the Aircard 790s and Huawei E5787, including appearance, interfaces, specs, and other features to find the answers. The latest Huawei E5787 also has a 2.4 inch touchscreen but no button on the front. The Huawei logo is below the screen. Like Netgear 790s , the power button is also on the top side, and the USB 3.0 and connectors for external antennas are available on the other side. The back cover could be opened and the battery is also removable. The difference is that the two connectors in the Huawei E5787 are located together and covered by a cap. The Aircard 790s antenna connectors are located on both sides of the USB port. Huawei E5787 also uses Micro SIM card size. 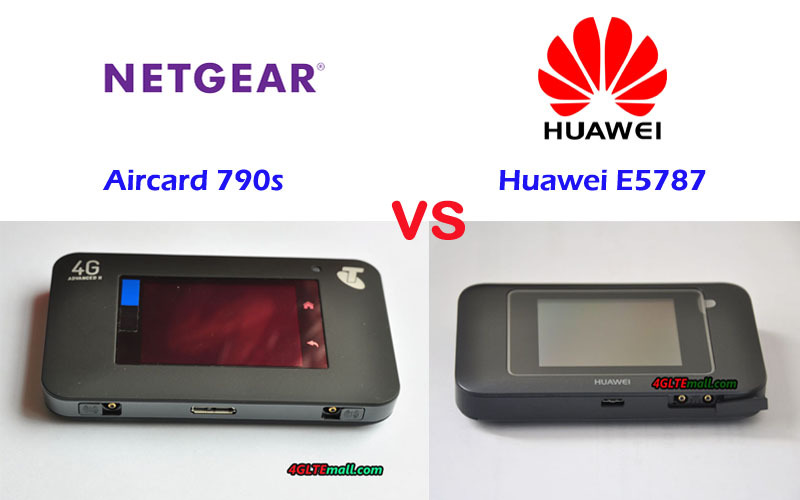 From the specs comparison, we can see the Huawei E5787 Mobile Hotspot and Netgear Aircard 790s has almost identical specs features. The main difference is on the variant models. Like other Huawei LTE hotspots, Huawei E5787 also has many variants for various network providers. LTE frequency bands worldwide. The Netgear Aircard 790s does not have many variant models. As we know, there is only EU version and Australia version. Then if you would like to have a mobile network, the Huawei E5787 may be better. 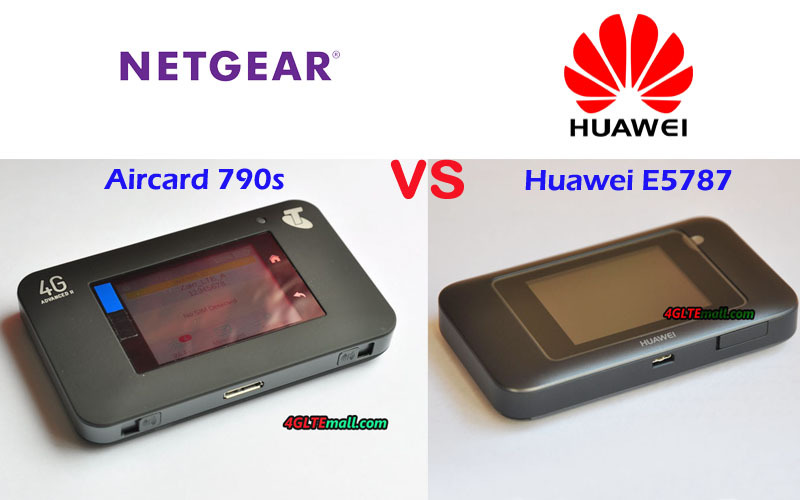 However, if your network provider’s network frequency bands can be supported by Aircard 790s, and the Netgear AC790S would be better for you because of the same specifications, the Netgear 790S has a better price than that of Huawei E5787.